Extremely Rare Opportunity! Prime Gaslight District Location! 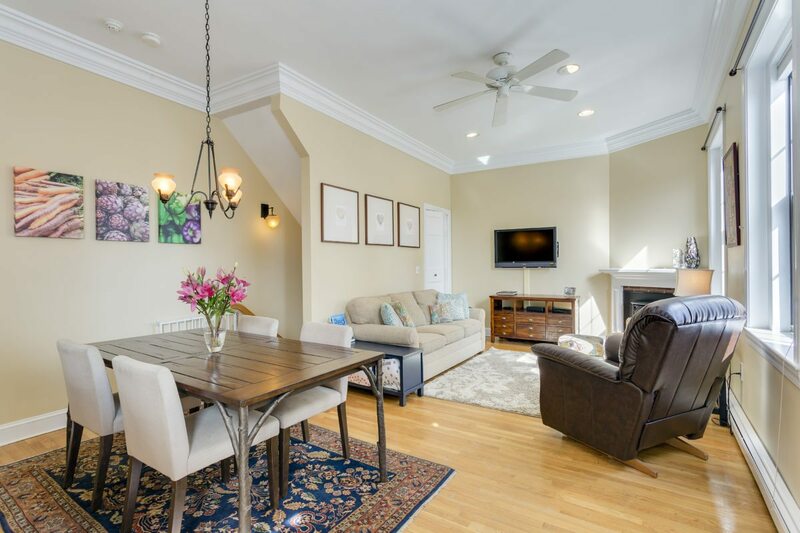 Private Entrance Tri-level Carriage House on Harvard Street with Deeded Parking at your door! Huge Easy access Private Deck for your Outdoor Enjoyment! Part of The Majestic and Historic Moses Dow House! This Outstanding Home offers a large Open Livingroom/Diningroom with Gas Fireplace for Memorable Entertaining! Custom Granite Gourmet Kitchen w/extra large Breakfast Bar adds to this Flexible Living Space! Towering Ceiling Height! Windows are Everywhere with Amazing Sunlight throughout! Gleaming Wood Floors! Lavish Master Bedroom en Suite with a nice Dressing area! Generous second bedroom! Large Den/Office & 2nd Full Bath! Big Separate Laundry Room with Great Storage! Enjoy Panoramic Skyline and Harbor views from the large common roof deck! Minutes to Financial District, Waterfront, Whole Foods Supermarket & Orange Line T Station, Buses! An Amazing Opportunity in a Highly Sought after Location! Click Here to see a virtual tour!